What difference does Islam make? To many in Europe, when thinking about Turkey's possible membership, it is the defining difference; to some politicians, it is one difference too far. Most people in Turkey, however, cannot understand what all the fuss is about. Konya is a flourishing city in the middle of Turkey. The city is clean and well run, well connected to points north, south, east and west. It was once known as the "citadel of Islam", and it is still more obviously devout than the cities to the west. It seems like a logical place to look for the great divide between the Christian and Islamic worlds. 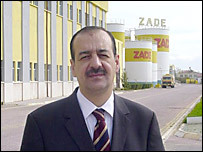 In one of the many business parks that ring the city sits Zade, a family-run oil processing firm. It employs 45 people and has about 5% of the Turkish cooking oil market. 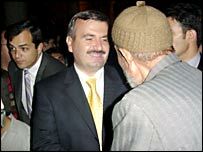 It is the kind of firm that has contributed to Konya's prosperity. It is run by the kind of man who scratches his head when asked what it is about Islam that has so many Europeans worried. "It's totally their problem," says Tahir Buyukhelvacigil. "We have proven ourselves many years ago. Sometimes I ask myself the same question, I ask myself 'Why are they so concerned about us?' and I don't understand." When asked about Islamic values, he yields a little. "Every country has its own traditions and customs - Europe has its traditions and customs, and we have ours. "Whatever Europe has today in modern daily life, we have it in Turkey. But we have higher family values, friendship values and solidarity, and I think this is our richness. That's something Europe can learn from us." There is a greater emphasis on family and neighbours in Turkey than in much of Europe, and it is especially evident during Ramadan, the month of dawn-until-dusk fasting. 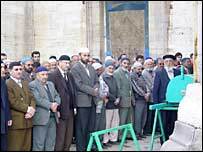 But whether it is a product of Islam, or of more complex societal forces, seems almost impossible to divine. Professor Omer Ulukapi, at Konya's university, describes the family as "the basis of our culture". But he goes on to list the factors - moral, ethical, religious and historical - that he thinks have contributed to the elevated status that the family still has. It is the same with the status of women. To Western eyes, the role of women in Turkey, especially in eastern Turkey, is a subordinate one. It is nothing to do with wearing a headscarf. Instead, it is the way in which women have a far lower public profile - and in general, the more religious the place, the lower that profile gets. But the more religious the place, the more conservative it is as well. Disentangling the impact of religion from the impact of society in general is an impossible task. Maybe this is what is perceived as the problem. Much of Europe is uninterested in religion these days. The same cannot be said for Turkey. A very high proportion of the population describes themselves as practising Muslims - more than 90% in a 1999 survey said they kept the Ramadan fast. In Konya, you can believe those sorts of numbers. But it still baffles residents that Europeans should worry about Islam in Turkey. The city's mayor Tahir Akyirek has a nuanced message: "I don't believe that we are different but I do believe that there are differences. "Of course there are differences, different cultures, different ethnicities, but the whole point is to learn together from these differences." It all seems a long way from the "clash of civilisations". It will not satisfy those who feel that Turkey's Islamic identity rules it out of the European club. But as far as most of the Muslims of Turkey are concerned, the "problem" lies elsewhere.